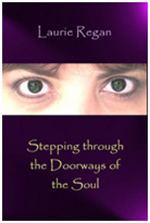 Laurie Regan is an award-winning author of spiritual books and a spiritual artist. Her short story The Gaia recently won a top award in the Spiritual Writers Network contest (2014). She has published four books and is a prolific visual artist with highly developed intuitive skills. Laurie sells spiritual artwork at the fairs. Among her most requested services are on-the-spot portraits of yourself, your spirit guides or whatever person/ message wants to come through to you at the time.